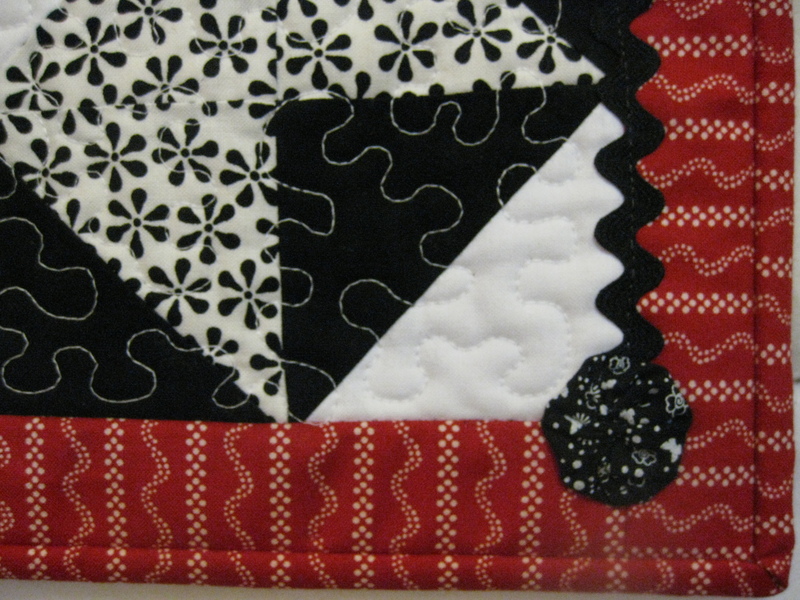 Pieced Brain: Black and White + Red = Table runner! Black and White + Red = Table runner! Back in April I posted pictures of six black and white blocks I pieced during a block of the month project. I had no idea what to do with them, as I was not inclined to turn them into a quilt. Cathie wrote in her comment that I might think of using a color to add some 'pop' to the blocks. Well, I turned them into table runners and used a red and white fabric to liven things up. The first table runner is completed. I used black rick-rack on the long sides, and decorated the ends with yo-yos. What do you think? Thanks, Cathie! Another Christmas gift ready!